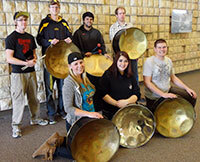 The University of Wyoming Department of Music’s Pan Band performs a free concert Thursday, Dec. 4, at 7:30 p.m. in the Buchanan Center for the Performing Arts concert hall. The group plays Caribbean steel drums, and the program will include familiar Brazilian songs, new tropical compositions and Christmas carols. The featured guest artist and composer will be Emily Lemmerman, who owns the Barracuda Steel Drums Company in Austin, Texas. She apprenticed in West Virginia with the renowned “father” of the modern steel drum, Ellie Mannette, a Trinidad native.